Poland Syndrome is rare and families can often feel like they are really alone. No one out there is going through the same thing and there is no one who really understands how to help. Unfortunately the medical professionals can also be ignorant of how to offer a proper diagnosis or not be up to date with latest medical procedures to offer to parents or individuals. 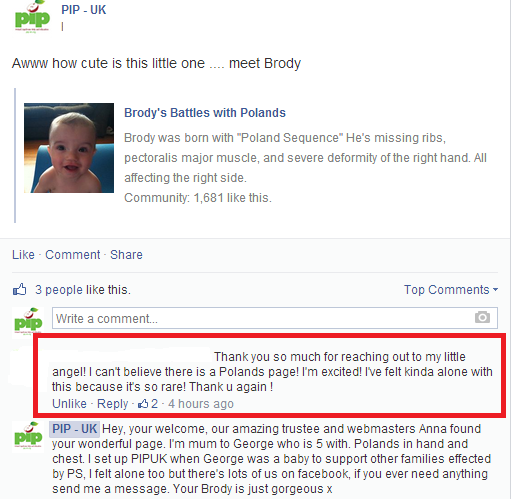 PIP-UK was set up to provide a first line of support to individuals with Poland Syndrome or families with a young child growing up with Poland Syndrome. Today we were delighted to receive a comment on our Facebook page to another grateful family. Poland Syndrome is known to be more prevalent in males than females it’s about 3:1 ratio. And strangely enough it seems to affect one side of the body more than the other, usually the right side (75% of the time). Poland Syndrome is rare that it is often not diagnosed in infancy. We recently heard of a lady who found out when her sister went to see a geneticist as the sister was considering having a baby. The sister had described the lady’s visible features and the geneticist wrote “Poland Syndrome” on the back of a business card. The lady was in her late 20’s!